Most of the Prepaid and Postpaid customers worries about ‘What about when mobile is switch off or under in No coverage?’ No need worry if you BSNL mobile device switched off or No signal you can get Missed call details by switching Missed Call Alert option with simple procedure. 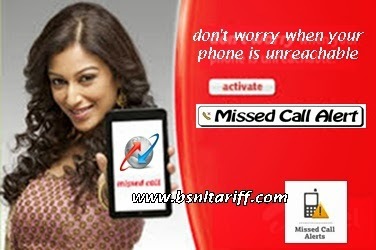 India’s most trusted telecom brand Bharat Sanchar Nigam Limited (BSNL) has provisioned Missed call alerts (MCA) option for customers both Prepaid plans mobile and Postpaid mobile services under BSNL Value Added Services using USSD code. This service makes BSNL customers tension free when their mobile is switched off or out of coverage area by providing missed calls alerts information when mobile is active or in coverage area. Here customers can activate or deactivate Value Added Services service under the below procedure. In few telecom circles Missed Call Alert can be activated through simple dialing USSD code as **62*+9117010#. This service under BSNL Value Added Services offers at Free of cost, no charges will be applied for opting Activation or Deactivation of Missed Call Alert services.